Commuters’ love of expensive gadgets mean they are at risk of losing up to £4,000 of technology every day by carrying them around in their work bag. The most popular item is the Blackberry, which nearly half of commuters take to work, followed by laptops and the iPhone 4 or 4S. Newcomers the Kindle Fire HD, the iPad mini and the Google Nexus 7 are all close behind, with 15 per cent of commuters taking them to work. The typical commuter bag now contains as many as six devices, which would come to a total of £4,100. 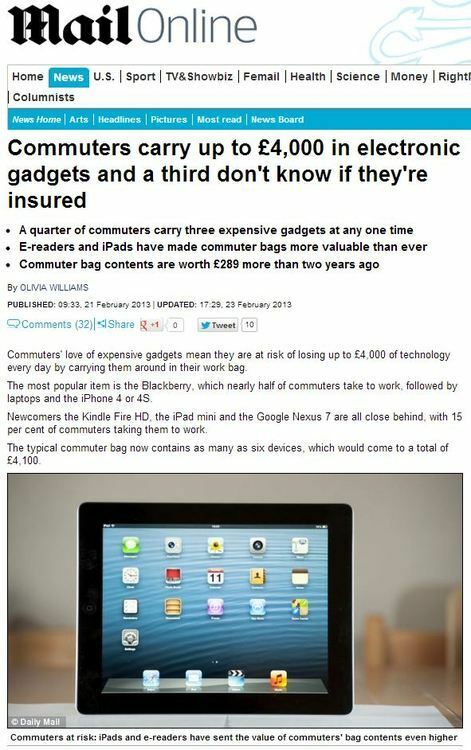 That’s right, all those consumer gadgets you’re carrying with you right now mean your bag is probably worth a total of £4,100, so you damn sure better keep a close eye on it next time you get on a bus, train, tram or horse and carriage. Still, after a moment’s reflection, it’s clear to see the figures here don’t really stack up – £4,100 is quite a lot of money, after all. Despite the ‘typical’ commuter bag being listed as being worth over four grand, what the article is really saying is that the outliers in the community might have a contents worth a maximum cost £4,100. However, according to more than 1,000 adults surveyed by esure home insurance, 28 per cent do not know if they are properly insured for them. Totting up all of these, esure estimate that a commuter carrying everything in this list would be carrying £4,182 – making up the £4,100 in their headline. However, the statement that ‘new research reveals that Brits are now carrying over £4,100 worth of technology to and from work’ is palpably false – this would only reflect the number of people who carry every item in the list to and from work regularly. Which, to be clear, would mean people who carry three different mobile phones and a sat nav on their daily commute. Not to mention the choice of laptop being one of the most expensive on the market, representing more than half of the final figure. What this is, very clearly, is the most extreme case possible, over-extrapolated from the data beyond all sensibility. It’s almost certain that there wasn’t a single respondent in the online poll who claimed to commute to work with the ‘typical’ bag as outlined in this story – a moment of reflection makes this abundantly clear. This entry was posted in Uncategorized and tagged daily mail, esure, nikki sellers, olivia williams on March 4, 2013 by Michael Marshall.